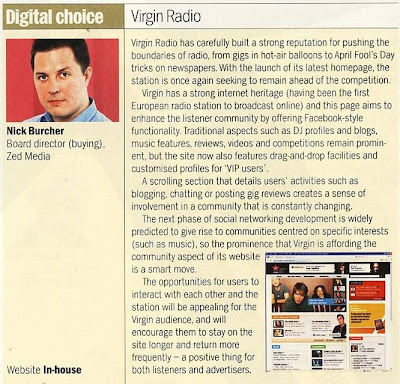 "Virgin Radio has carefully built a strong reputation for pushing the boundaries of radio, from gigs in hot-air balloons to April Fool's Day tricks on newspapers. With the launch of its latest homepage, the station is once again seeking to remain ahead of the competition. Virgin has a strong internet heritage (having been the first European radio station to broadcast online) and this page aims to enhance the listener community by offering Facebook-style functionality. Traditional aspects such as DJ profiles and blogs, music features, reviews, videos and competitions remain prominent, but the site now also features drag-and-drop facilities and customised profiles for 'VIP users'. A scrolling section that details users' activities such as blogging, chatting or posting gig reviews creates a sense of involvement in a community that is constantly changing. The next phase of social networking development is widely predicted to give rise to communities centred on specific interests (such as music), so the prominence that Virgin is affording the community aspect of its website is a smart move. The opportunities for users to interact with each other and the station will be appealing for the Virgin audience, and will encourage them to stay on the site longer and return more frequently - a positive thing for both listeners and advertisers."